Veracity's network video integration range takes the pain out of installing IP-Surveillance systems. TIMENET is an essential component of any DVR or NVR installation, as it delivers an atomic reference clock to synchronise recornings to, in a unique compact and low-cost package. CAMSWITCH is a PoE switch designed for IP cameras with universal power input, and Veracity's OUTCLASS adapter corrects problems found in some PoE equipment. Delivering reliable PoE power to IP cameras is easy with CAMSWITCH, even if only a low-voltage supply is available. 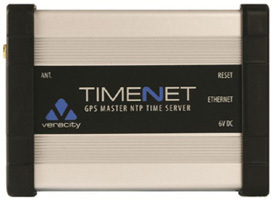 TIMENET integrates a GPS receiver and master NTP clock server into a single device which can be directly connected to the network. TIMENET is extremely compact, can be wall-mounted, uses very little power and is less than half the cost of competing solutions. 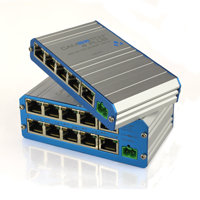 CAMSWITCH Plus is a 4+1 port (or 8 + 2 port) Power over Ethernet (PoE) switch especially designed for IP video applications. It delivers both the power supply and network connection required by up to four IP cameras from a single, easy to install unit.